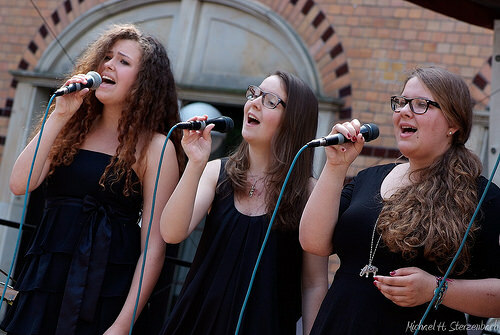 With the Kicks & Sticks Voices, founded in 2010, the Hessen State Youth Jazz Orchestra established its own jazz vocal ensemble, with highly talented discoveries. But it wasn’t long until a second vocal ensemble was founded, complementing the Kicks & Sticks Junior Band. 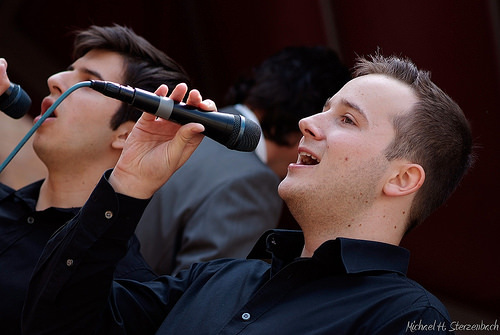 Band leader Holger Fröhlich commented: “The first workshop session with the junior vocal group took place early in 2011; the results were phenomenal”. Thus the first singers who joined the Junior Voices have already moved up into the Kicks & Sticks Voices. The Junior Voices are an ensemble, currently with eleven talented young singers who have dedicated themselves to the difficult task of singing vocal jazz. These youngsters, who are capable of singing pieces of professional difficulty, are almost unique in the German youth jazz scene. As well as singing in the ensemble, they also sing solos, enhancing the Junior Band of the Hessen State Youth jazz Orchestra with their convincing quality and drive.